Boy, do I hate when I do that. No excuses. Except…could I tell you all about how I was copy editing/proofreading/fine-tooth combing Dolphin Girl? Or about how Whatcha’ Reading Now? launched their sports issue last week? Or about how I had family come for a visit? Or how I’m beta reading an incredible novel for a critique partner? But it all comes down to the same thing. Excuses. Are you wondering what deadline was missed? Last week’s Random Acts of Publicity campaign–which is such a truly awesome idea–that’s what. 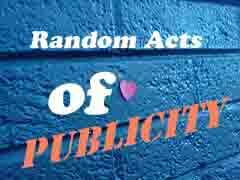 If you know about Random Acts of Publicity skip ahead. But if not, here’s the scoop. Every year Darcy Pattison runs this on her blog and the idea is we’re supposed to celebrate our friends’ books by blogging, tweeting reviewing, linking–you get the idea. Kai Strand — Recently I judged a global contest for e-books (I think that’s probably another post) and I read Kai’s book The Weaver, which was so well-written and an incredibly unique premise. The main character, Mary, lives in a little town of word weavers, a population of people who specialize in storytelling. She suffers because the skill doesn’t come naturally to her. The thing that I really loved about this book was how Kai wove multiple stories into the main story and the entire work had an original fairy tale feel. Kai doesn’t know me from brussel sprouts, which ups the randomness of this shout out. Janeen Mason — If you don’t know Janeen or her books, you really need to look for them. I swear she’s going to go all Caldecott on me one day. Beautiful, beautiful illustrations. This year alone she’s had two incredible books: The Gift of the Magpie, which is an adorable story about birds and a love of shoes that she both wrote and illustrated and Fish Facts, the latest of her ocean themed non fiction picture books. Janeen and I share a love of the ocean, so I’ll be adding this one to my collection. Christina Diaz Gonzalez — I was so blessed to have been a beta reader for Christina’s debut novel The Red Umbrella. Recently it was selected by for the Common Reading Program by FIU for the incoming freshman class. It’s the beautiful and heart wrenching story of Operation Pedro Pan, the exodus of children from Cuba to the U.S. in the midst of Castro’s revolution. I’m anxiously awaiting her second novel, A Thunderous Whisper, which will be released in 2012. Rhonda Stapleton — For a long, long, long time I was a lurker on Verla’s Blue Boards, which is a forum for aspiring children’s book writers if you haven’t been there. Now I post every once in a while, but way back when I read comments by all these other brave souls who were actually sharing the results of their queries and rejections in pursuit of their agent and publication. Rhonda was one of those brave souls and I cheered (to my-cowardly-self) when she got her book deal and I was finally able to read her books. Recently, I ordered Pucker Up, the third and last book in her Stupid Cupid trilogy. These books are funny and sweet, so read ’em if you haven’t yet! Laura Murray — At my very first SCBWI, in my very first critique group, Laura read a picture book about a mischievous gingerbread man who during the first day of Kindergarten takes off to explore the school. Along the way the gingerbread man meets some pretty important people in the school–the cafeteria lady, the school nurse, the coach, and, of course, the principal. It was absolutely adorable when she read it and so I was thrilled for Laura when she sold it to Putnam. The Gingerbread Man Loose in the School is fresh off the presses and new and fun and has adorable illustrations. Danielle Joseph — In South Florida we are very fortunate to have an incredibly tight SCBWI chapter and writing community, which centers around a critique group run by the talented teacher Joyce Sweeney. During my first class/group with Joyce, Danielle read the first chapter of Dead Air, which was later re-named Shrinking Violet, a story about a shy girl who loves music and wants more than anything to be a DJ. Ultimately, this book went on to become Danielle’s debut novel and, now, Shrinking Violet has another name — Radio Rebel, a Disney made for TV movie which will air in January 2012. Not only that, but Danielle has a new novel–her third–Pure Red. I pre-ordered for my Kindle and it’s coming on October 1. Can’t wait! Okay, that’s it. One shout out for every day of the week. And, if you’re wondering why the list is in the order that it is, please rest assured that I don’t play favorites. In the spirit of all things random, names were drawn from a coffee mug by my eleven year old. And if you’re wondering why it’s Wednesday instead of the beginning of this week, well, we launched the Whatcha’ Reading Now? blog yesterday, but I know, I know, I promised. No more excuses. September 14, 2011. Tags: darcy pattison, pay it forward, random acts of publicity 2011, Whatcha Reading Now. Uncategorized. I love, love, LOVE your post. Thanks for including me. We are blessed to be in the company of such fine writers in Florida, aren’t we? And I agree about your prediction for Janeen Mason! One more thing: Remind me NEVER to play you in Trivial Pursuit. It clearly would not be good for my ego. September 14, 2011 at 2:06 pm. Permalink. I’d explain how the timing on this post is so amazing, but it would take too long. So instead I’ll just say, I’m super glad you missed the deadline. I’m also very thankful for the truly nice words about The Weaver and the reference to brussel sprouts! September 14, 2011 at 3:39 pm. Permalink. Thank you both for stopping by and leaving comments! Kai, How nice that the timing ended up good! I guess sometimes there’s a silver lining in screw ups and your comment makes me feel better about mine. September 14, 2011 at 8:12 pm. Permalink.